On April 19th, former U.S. Ambassador to Turkey, Eric Edelman and former National Security Advisor to Vice President Joe Biden, Jake Sullivan discussed the deteriorating US-Turkey relationship as part of the USIP-PSA congressional briefing series Dr. Graeme Bannerman moderated the discussion. This was a closed, off-the-record event for congressional staff. Ambassador Eric S. Edelman retired as a career minister from the U.S. Foreign Service on May 1, 2009. He is currently a Roger Hertog Practitioner in Residence at Johns Hopkins SAIS and Counselor at the Center for Strategic and Budgetary Assessments. Edelman has served in senior positions at the Departments of State and Defense as well as the White House where he led organizations providing analysis, strategy, policy development, security services, trade advocacy, public outreach, citizen services and congressional relations. As the undersecretary of defense for policy (August, 2005-January 2009) he oversaw strategy development as DoD’s senior policy official with global responsibility for bilateral defense relations, war plans, special operations forces, homeland defense, missile defense, nuclear weapons and arms control policies, counter-proliferation, counter-narcotics, counter-terrorism, arms sales, and defense trade controls. He served as U.S. ambassador to the Republics of Finland and Turkey in the Clinton and Bush Administrations and was principal deputy assistant to the vice president for national security affairs. In other assignment he has been chief of staff to Deputy Secretary of State Strobe Talbott, special assistant to Undersecretary of State for Political Affairs Robert Kimmitt and special assistant to Secretary of State George Shultz. His other assignments include the State Department Operations Center, Prague, Moscow, and Tel Aviv, where he was a member of the U.S. Middle East delegation to the West Bank/Gaza autonomy talks. He has been awarded the Department of Defense Medal for Distinguished Public Service, the Presidential Distinguished Service Award, and several Department of State Superior Honor Awards. In January 2011 he was awarded the Legion d’Honneur by the French Government. He received a bachelor’s degree in history and government from Cornell University and a doctorate in U.S. diplomatic history from Yale University. 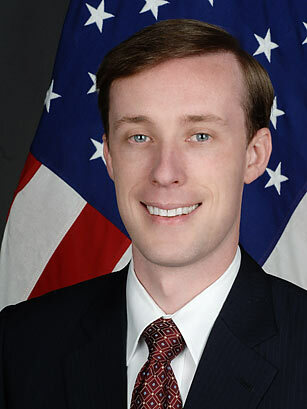 Jake Sullivan is a Martin R. Flug Visiting Lecturer in Law at Yale Law School. He served in the Obama administration as national security adviser to Vice President Joe Biden and Director of Policy Planning at the U.S. Department of State, as well as deputy chief of staff to Secretary of State Hillary Clinton. He was the Senior Policy Adviser on Secretary Clinton’s 2016 presidential campaign. Previously, he served as deputy policy director on Hillary Clinton’s 2008 presidential primary campaign, and a member of the debate preparation team for Barack Obama’s general election campaign. Sullivan also previously served as a senior policy adviser and chief counsel to Senator Amy Klobuchar from his home state of Minnesota, worked as an associate for Faegre & Benson LLP, and taught at the University of St. Thomas Law School. He clerked for Judge Stephen Breyer of the Supreme Court of the United States and Judge Guido Calabresi of the U.S. Court of Appeals for the Second Circuit. Sullivan holds undergraduate and law degrees from Yale and a master’s degree from Oxford. Dr. Graeme Bannerman is a Scholar at the Middle East Institute. As such, he frequently provides commentary on Middle Eastern issues for numerous American and international media outlets including the BBC, Canadian National television, NBC, CBS, PBS News Hour, Fox News, al-Hurra, al-Jazeera, and others. He is Vice Chairman of the Board of Hands along the Nile and serves on the Board of Partnership for a Secure America (PSA) and the Tahrir Institute for Middle East Policy.